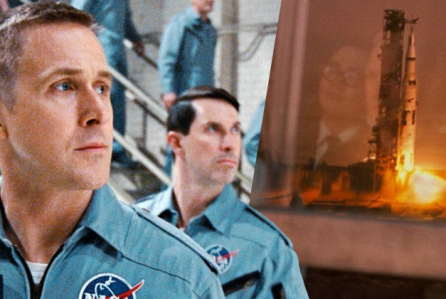 I've been on the road all day, only stopping periodically to see what the buzz is all about, and each time the weirdest headline kept grabbing me, "Chazelle's First Man is un-American! Ryan Gosling Defends Film". Mind blown over what the Hell this could possibly be about, I found out that some were claiming his film, which depicts Neil Armstrong's historic flight to the moon, doesn't show the unforgettable moment when he plants the American flag. And of course, this is an outrage. Or at least it's a Twitter outrage, not a real one. You've probably seen the screaming, angry rhetoric as well, mostly from conservatives like Bill "I've never been right about anything" Kristol,and Florida senator Marco Rubio who calls it "total lunacy", neither of whom has actually seen the film. So what's the truth? “I wanted the primary focus in that scene to be on Neil’s solitary moments on the moon — his point of view as he first exited the LEM, his time spent at Little West Crater, the memories that may have crossed his mind during his lunar EVA." "I think this was widely regarded in the end as a human achievement [and] that’s how we chose to view it. I also think Neil was extremely humble, as were many of these astronauts, and time and time again he deferred the focus from himself to the 400,000 people who made the mission possible." Because we're talking about Twitter outrage, and faux-conservative outrage at that, of course this was blown out of proporation and slanted to mean that Chazelle was trying to strip America of this incredible feat. That's obviously absurd, even for a movie that will play globally, but you can see how Gosling opened the film up to criticism. I'm sure he was just trying to talk to the audience, and since he was at the Venice Film Festival it was a gaggle of international press. Although Neil didn’t see himself that way, he was an American hero. He was also an engineer and a pilot, a father, and a friend, a man who suffered privately through great tragedies with incredible grace. This is why, though there are numerous shots of the American flag on the moon, the filmmakers chose to focus on Neil looking back at the earth, his walk to Little West Crater, his unique, personal experience of completing this journey, a journey that has seen so many incredible highs and devastating lows.